One big drawback to using Query/400 is that it's often difficult to keep track of the files used within your queries. Figuring out what files queries use often involves going into each individual query, which can be a big issue if you update a file definition without being aware that the file is used by a query or queries. Wouldn't it be great if there were a tool like DSPPGMREF that would give you a list of the files referenced in a query or queries? That's where Display Query References (DSPQRYREF) comes in. LSTQRYF sends a list of the query and file information to the specified file. 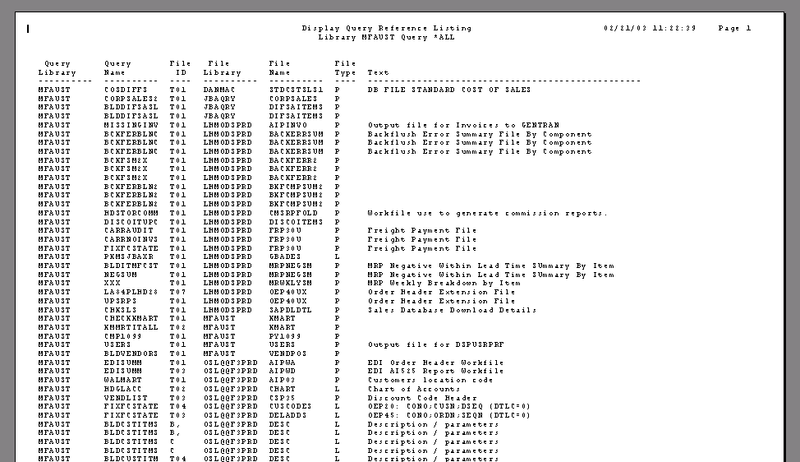 LSTQRY generates a report containing query and file info for printing or displaying to the screen. Both of these Query Management queries combine information from QRYFILES with information from SYSTABLES in QSYS2 library. SYSTABLES contains file information for all of the data files on your iSeries. The table type (physical or logical) and table text are retrieved from SYSTABLES. This output is output in order by file library and file name. The command object DSPQRYREF is used to execute the application from the command line. Here, lib is the name of the library containing your source file. Now, you're ready to compile your programs. Start with the CL source. You should modify it for this program so that, within the line below, *LIBL is replaced with the name of the library containing the source for this file. Again, you need to replace lib with the actual library name. The Query Management queries will select the data from your files. The Query Management form formats this data when printing or displaying the listing. Once you've created all of the objects and programs, remember to remove QRYF, QRYFILES, and QQRYSRC from QTEMP library prior to executing the command. The first parameter (QRYLIB) is required; it identifies the name of the library containing the query or queries to be analyzed. This value can be specified as a single library name or any one of the special values: *ALL for all libraries, *USRLIBL for the user portion of the library list, *LIBL for the full library list, or *CURLIB for the user's current library. The second parameter (QRYNAM) identifies the name of the query to be analyzed. The special value *ALL can be used to search for all queries in the library or libraries specified. The third parameter (OUTTYPE) is also required; it identifies the type of output to be generated. The special value *PRINT will cause a printed report to be generated. Special value * will display the output to your screen. The special value *OUTFILE can be used to send the output to a physical file. When this value is specified, additional parameters become available that allow the user to define the library (QRYFLB) and file (QRYFNM) to receive the output from the listing. The parameter ADDRPL also becomes available and allows users to define whether or not they want to add records to an existing file or replace any records in an existing file. Below is a sample of the output generated by this utility. Whether you output the data to the screen, generate a printed report, or send the listing to a physical file for further analysis, DSPQRYREF can help you get a better handle on what files queries use.